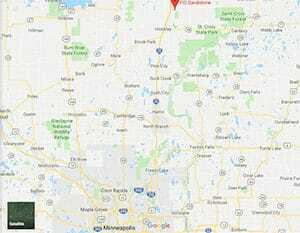 Location: Located 100 miles northeast of Minneapolis/St. Paul, 70 miles southwest of Duluth, off I-35. Background: FCI Sandstone opened in 1939, closed in 1949, then reopened in 1959. Notable inmates include former NHL player Mike Danton (served 4 years for conspiracy to commit murder before being transferred to Canada in 2009), serial bank robber David Brankle (serving a 21-year sentence), and disbarred attorney Marc Dreier (serving a 20-year sentence for securities fraud, wire fraud, and money laundering). Housing: Inmates are housed in dormitories, which are divided into two-person cubicles. Health Services: Health services at FCI Sandstone include episodic visits for new or recurring medical or dental symptoms through a sick call system, chronic care management for chronic and infectious diseases through enrollment in chronic care clinics for regular care, routine dental care, medical and dental emergency care for injuries and sudden illness, age-appropriate preventive care to promote optimal health and functional status, prescription glasses, and medications. Psychology Services: Psychology services at FCI Sandstone include screening, assessment, and treatment of mental health problems, individual and group counseling, psycho-educational classes, self-help and supportive services, and referral to Health Services for medical treatment of a mental illness. The Department offerings include Values Training and other voluntary groups. Consultation, crisis intervention-type counseling sessions, relaxation training sessions, self-study, and meditative techniques are available. Residential Drug Abuse Program (RDAP): FCI Sandstone houses a Residential Drug Abuse Program (RDAP). Drug abuse programs, a Drug Abuse Education course, a Non-Residential Drug Abuse Program (NR-DAP) and groups for Alcoholics Anonymous (AA) and Narcotics Anonymous (NA) are also available. Education Services: FCI Sandstone provides literacy, GED, and English-as-a-Second Language (ESL) programs. Incentive awards are provided to recognize inmates making satisfactory progress and successfully completing the literacy (i.e., GED and ESL) program. Inmates may also receive incentives for progressing to various levels in the GED or ESL programs. Graduation ceremonies recognize GED, ESL, and Occupational Education completions. Adult Continuing Education (ACE) courses and a parenting program are also available. High school diplomas and post-secondary programs are available through paid correspondence programs. Advanced Occupational Education: FCI Sandstone does not offer any advanced occupational education programs. Vocational Training: FCI Sandstone offers vocational training in Auto and Building Trades. Apprenticeship: FCI Sandstone offers apprenticeships in Culinary and Welding. Library Services: Leisure libraries offer inmates a variety of reading materials including periodicals, newspapers, fiction, nonfiction, and reference books. Inmates are provided access to legal materials and an opportunity to prepare legal documents. The TRULINCS Electronic Law Library provides inmates access to case law, prison policy, federal rules of court, and other information of a legal nature. A copying machine and typewriters are available for inmate use. UNICOR: The FCI Sandstone UNICOR facility produces clothing and textiles, and handles services. Commissary: Inmates can spend up to $360.00 per month in the commissary. A bi-weekly spending limitation is used at FCI Sandstone. A wide variety of items are available for inmate purchase, including radios, MP3 players, food, drinks, ice cream, clothing, and shoes. Recreation: Leisure activities at FCI Sandstone include organized and informal games, sports, physical fitness, table games, hobby crafts, music programs, intramural activities, social and cultural organizations, and movies. Art activities include paintings and sketches rendered in pastels, crayons, pencils, inks, and charcoal. Hobbycraft activities include leatherwork, clay, mosaics, crochet, knitting, etc. Wellness programs include screening, assessments, goal setting, healthy living, diabetic education, fitness/nutrition prescriptions, and counseling.